InterContinental Hotels Group (IHG) has been revamping its rewards program this year and the name of their frequent guest program was changed from Priority Club to IHG Rewards Club on July 1, 2013. The status match program has been tweaked as well. Previously, it was possible to get the IHG Rewards Club status in just fewstays, when all the points earned counted towards the 60,000 points minimum. Starting in January this year, only the base points and some other activity specifically included by IHG counts towards it, however. IHG Rewards Club used to match from Accor’s Le Club Accorhotels/A Club and Club Carlson, but no longer does. It is still unclear if they continue to match from Choice Privileges. You can either call 1-888-211-9874 (If you are not located in the United, just use Skype), tell the person that you would like to do a status match from the competitors program and follow the instructions that they give you. You can send email an email to ihgrewardsclub@ihg.com and request a status match to IHG Rewards Club Platinum. The email route is sometimes a black hole, so I would strongly suggest that you call and get the ihg.com-ending email address of the agent. Sometime later this year, the matched status will carry all the way to early 2015, but it is unclear, what the exact cut off date will be. Gold Ambassador members that match to Platinum status will get a new Platinum Ambassador package that will come with another free weekend night certificate and a voucher for points that you can deposit to your account (5K, 10K or 15K). 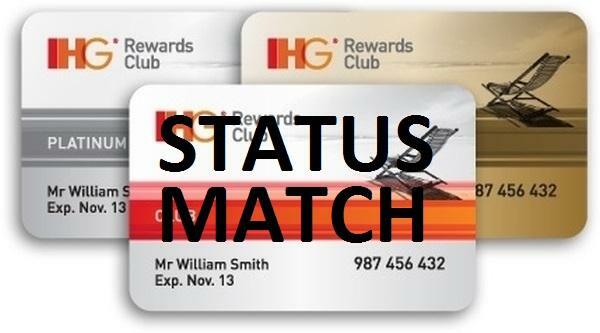 IHG Rewards Club has made both qualifying for status and getting status matched more difficult during the 2013. They dropped matching from Club Carlson or Le Club Accorhotels that have been the easiest programs to get status without setting your foot to their hotels. You can still match from Club Carlson Gold or Le Club Accorhotels Platinum to Best Western and then use your newly minted Best Western status for IHG Rewards Club Gold or Platinum match.